I agree! Especially with the Sharks. Everything seems small to me in the pictures, but the shark in the upper left corner of the 4th picture is about 5-6ft long, just to give a scale. The albino croc was damn near 10 feet. Soooo, does anyone have the equipment necessary to disable the skim function in a jeep ecu? E, you're a bad influence. 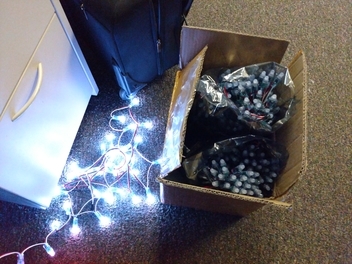 I ordered close to 300 feet of fully addressable Christmas lights from China (via DHgate) the Thursday after you posted your Xmas bike. They came in yesterday via DHL, so actually quite quick. There are 1050 pixels, which comes out to 21 chains/bundles of 50. Got them half off in a Cyber Week sale, and had another $45 off coupon that got stacked in for a total cost, with shipping, of $144 for the lights. There was a price break at 1000 pixels, and the extra 50 let the $45 coupon work. 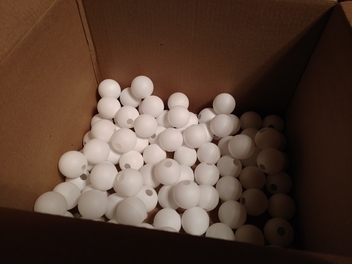 Also ordered from Amazon were 720 ping-pong balls for diffusers, 100 suction cups, a 20A 5V power supply, and a controller for the lights since I didn't want to spend too long making my own. I dare not calculate the total cost right now. The two big anti-stat bags hold 10 bundles each. 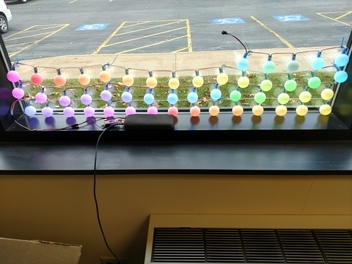 They'll tentatively be installed in the windows at the office as a large scrolling led matrix display. I may end up selling the leftover bundles next year. Nice! Can't wait to see it. I had no idea a forum existed for such a thing, got a link? I think since the bike needs new fairings anyway, I may use this set to make a dedictated Christmas set. Drill holes in the plastics and poke the lights through. That way I could glue them in and not only would it look better since you wouldn't see the wires, but I wouldn't have to deal with suction cups coming off. 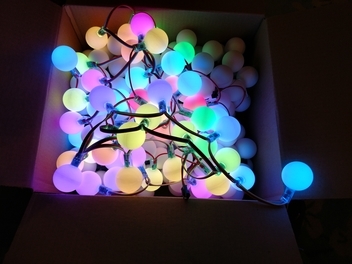 These are quite blinding, and still directional even though the RGB LED is diffuse already. 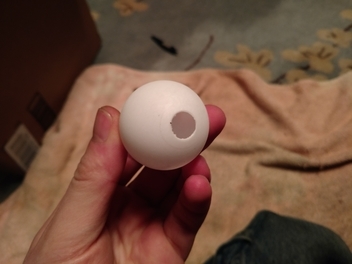 I decided to put ping pong ball diffusers on them, which meant punching holes for the lights to fit into. 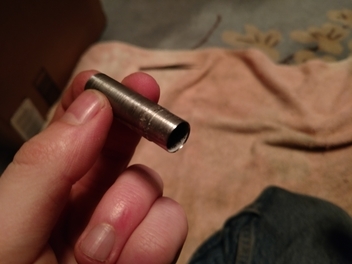 They have retaining prongs to fit in a 12mm drilled hole. Add one custom made 0.45" hollow cutter. I went slightly smaller so that there was no chance of them popping off when handling the bundles. 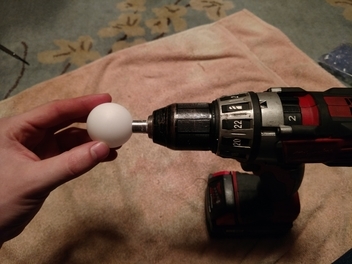 Then you chuck it in your drill, and introduce the ping pong balls. And some alien podules will form. Five strands out of the 13 required, all crated up and ready to go. 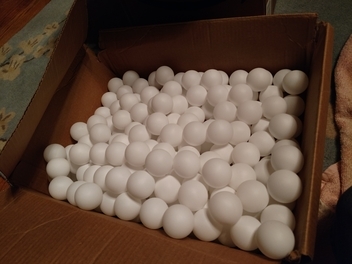 I have 3 more bags of 144 ping pong balls showing up tomorrow. 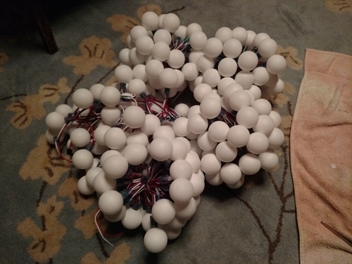 How do the balls attach to the lights? The lights have little prongs/barbs in the flexible plastic that lock into the holes. 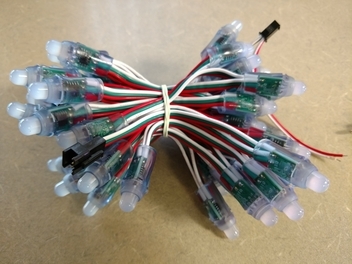 If you look at the full-size photo of the bare bundle, you can see the four prongs on each light. Thats genius. And can you control what color they are? Yep, the controller I'm using now is a homemade one that cycles through a few presets. Looks awesome! Great colors. I spent a bit of time checking out that forum. Those guys are serious about their Christmas displays! I can barely get myself to get our lights down from the attic every year hahaha. I only joined to download some stuff they had as attachments, lol. So a local brewery was selling off their used wooden beer aging barrels, and I bought two of them. What should I make? They are 59 gallons and look like THIS RIGHT HERE, but used.